Written by Catherine Saxelby on Thursday, 18 June 2009. Here's a collection of my favourite articles published in magazines, newspapers and on blogsites. Oh and tv too. The most recent are at the top. I've enjoyed researching, writing and editing them all - hope you like reading them too! Written for the Australian Fitness Network, this post is aimed at personal trainers to help their clients enjoy themselves in moderation over the silly season when there’s lot of alcohol on offer. If you’re on a weight loss program, you may find my 12 best Christmas tips handy. No-one wants to lose weight, then regain it all over Christmas! I compare serve sizes from labels. Are they a help or a hindrance? Remember the size of that portion you eat is crucial in the war against weight gain. If you think your cereal weighed 30 grams but it really weighed 50 grams, this can explain why you’re gaining weight without realising! I explain the often misunderstood nutritional fact that despite freshly-squeezed juice having a health halo and being marketed as natural, nutritious and fat-free, it is a far less healthy option than a real piece of fresh fruit. This article will help you to decipher the difference between sugar and sugars and make healthier choices when you go shopping. Read my review of the much-hyped and controversial movie, "That Sugar Film" by Damon Gameau. I cover off on this essential mineral, how it can help you to better health(think lower blood pressure and strong bones), and why you won’t now find it on food labels. Plus how to get your daily potassium easily at breakfast, lunch, dinner and snacks. Buzz Foods: Are they actually good for me? I join forces with dietitian Zoe Wilson to examine the health benefits of the latest super foods. I cover acai, chia, goji, quinoa and cacao while Zoe tackles kale and spirulina. There's also info on three bush tucker super foods too (billygoat or bush plums, lilli pilli and lemon myrtle) from Samantha Martin. Here's a short one-pager I wrote for Sunday Life magazine in the Sun-Herald. It talks about the rise and rise of ancient grains and I list my six easiest ancient grains to cook and serve for your meals. In one of my columns for New Idea magazine, I wrote about canned lentils and canned cannellini beans as top examples of processed items that CAN be nutritious and make your life easier. Someone else has done the soaking and boiling for you! Another column for New Idea magazine, this topic helps two groups of people - parents who eat meat but have to cook for a child who's vegetarian (they can serve this yummy lentil rice salad as a side for them but a main for the vego) and newbie-vegetarians who need a bit of help coming up with balanced meals. Diet experts (including Catherine) reveal what they eat on a typical day as well as their occasional indulgences, the food trends that horrify them and what they'll never eat again. It's no secret that olive oil has won its way into our kitchens in recent times. And it's a top oil responsible for many of the health attributes of the famed Mediterranean Diet. But is it the ONLY oil to buy? And which is the best olive oil - extra virgin, pure or light? Need energy to jump out of bed, get the kids organised, pack their lunches, put on a load of washing and head to work? Then you'll need a hard-working nutrition-packed breakfast to get you going. 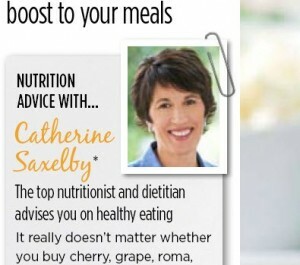 Catherine Saxelby outlines her morning method. Who's winning the food fight? A new national survey on Australian diets confirms children from poorer families tend to eat more junk food and are more likely to be overweight. It also shows nearly all children, rich or poor, fat or slim, consume more sugar and salt than they should while hardly any teenagers eat enough fresh fruit and vegetables. Catherine Saxelby investigates. Vegetables - fresh, frozen or canned? "Fresh vegetables" used to be the motto for healthy eating. But busy lifestyles leave little time for food preparation or growing your own veggies. Unless you can fit in a daily shop, it means that you'll have to rely on frozen or canned in place of fresh - at least for some meals. Here I address the issues of how fresh is "fresh", what nutrition you lose, what's added (eg, salt), and which are the best kinds of frozen or canned to buy. Goji - super food or marketing hype? Hailed worldwide as a nutritional powerhouse, are gojis really a super food or is it just marketing overkill? Check the portion on your plate. It may be as many as 8 times the amount that represents a standard serve. Here's how to spot the portion distortion. Catherine interviews Susan Anderson, National Manager of the successful Tick Program run by the Heart Foundation, on how companies get the red tick of approval for their products. "We don't just hand over the Tick! Food must meet our strict nutrition standards for saturated fat, salt, kilojoules, vegetables and fibre," says Susan. We can't live without colour. But the bright hues in lollies, cordial and drinks are going ‘natural' in an effort to make our food more appealing and less processed. Filling and nourishing, soup has emerged as a fat-fighting star. It's all to do with what's called satiety and kilojoule-density. What's the best way to eat for eye health? If you want to fend off macula degeneration or cataracts as the years go by, here's the latest advice on spinach, carrots, omega-3s, trans fats, butter, margarine and your body weight. Groups, pyramids or plates? Food guides are designed to help you assess your overall diet and build a varied, balanced diet. But how useful are they? Snacking doesn't have to be fattening if you keep the portions small and mix the indulgences with the healthier options. Check out 12 snacks that won't blow out the scales. Fats play a crucial role in health and there's many different ones. See all the different fats and how they compare for usages, saturated fat content and healthy rating. Why do some foods stand head and shoulder above the rest? Discover why in this fascinating look at nutrient-density - how to pack the most nutrients into the fewest kilojoules. Catherine received a Highly Commended award from the Food Media Club in 2004 for this one-pager packed full of easy ideas for parents. Discover the top 20 super foods for holding back the clock and slowing the ageing process. Some are things you'd suspect but some will surprise you ... and find out why.